At the end of the 16th century, Brantôme, the chronicler of the Court of Valois, was surprised that the highlights of the life of "Jacques Galiot, Grand Equerry of France" were hardly talked about any longer. Indeed, when three centuries later the ruins of the magnificent château of Galiot were used as a barn for fodder, it did not cause a stir. Yet the western wing of what was, in the 16th century according to Brantôme, "the most beautiful house of France that one would have to see", had been listed as a historic monument in 1841 by a certain Prosper Mérimée. So, who was this personality that historian Brantôme clearly considered as one of the most prominent figures of his time, commissioner of a residence of such quality that it knew no rival in the kingdom of France? Jacques Ricard de Gourdon de Genouillac (1465-1546), known as Galiot, named after a knight of the Round Table, belonged to the provincial gentry. His social climbing, while not rare for the time, nevertheless remained exceptional in its duration. A page of Louis XI, introduced to the court by his uncle, captain general of the king's armies, he quickly held military functions of the highest importance: captain of 25 lancers (which later increased to 50, 60 and 100 in 1536) and many strongholds, engaged in many operations with Charles VIII and then Louis XII, in 1512 he obtained the responsibility of master and captain general of the artillery. Indeed it was to him that Francis I owed the victory of Marignan as written by the King himself to his mother Louise de Savoie. From 1517 he became a knight of the Order of Saint Michael and, two years later, Seneschal of Quercy. As the ultimate consecration he was made Grand Equerry of France in 1526. His heavy military and administrative burdens and his actual commitments in the field did not prevent him, however, from rigorously managing his affairs. A friend of Guillaume Budé, he was also a man of great culture, an art lover, a lover of precious books and a great builder. In the early 16th century, Galiot only had the "Tour de Sal" in Assier, his share of this castrum inherited from his mother Catherine du Bosc. His ambitious project took shape over the years, after tough negotiations conducted until 1534 to acquire all the land of the seigneury of Assier. The construction would thus be conducted in several campaigns, according to the state of the acquisitions. In the 1510s, only a small plot, between the south and east of the tower of the castrum, could be built on: so it was in this location that Galiot erected a first huge corner tower and part of the south wing. The still Gothic character of certain elements in place, such as corbels and vaulting ribs, can be used to date this first project. However, the architectural styles of the Loire Valley very quickly made their way in. 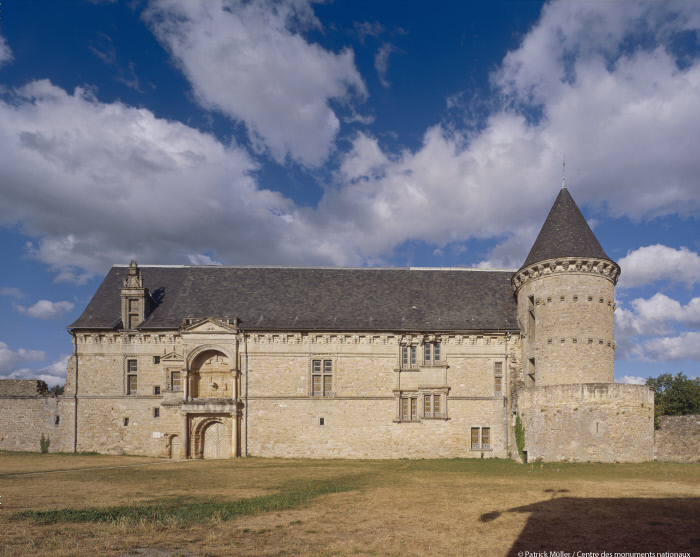 The evolution of the construction is evident in the continuity of the south wing, erected when Galiot was Grand Master of Artillery from 1512. The final plan of the château formed a quadrangle flanked by round towers topped with Imperial type domes; its model was to experience great fortune well beyond Quercy. A portico gallery, vaulted with stone slabs, connects the entrance wing to the chapel in the north-east and the east wing whose floors are served by a large straight dogleg stairway. This huge project was completed between 1535 and 1540 by the elevation of a triumphal entrance, with the rider statue of the master of the house and the clever use of the ancient Ionic and Corinthian orders. The full scope of the character is expressed in the continuity of the décor entirely devoted to the glory of Galiot. Personal emblems, the Gourdon coat of arms, cannon balls with three sparks, sit alongside the attributes of the Grand Master of Artillery, culverins, artillery triangles and military trophies, with, from 1526, the sign of his supreme responsibility, the sword of the Grand Equerry and its fleur-de-lis sheath. In addition are allegories on the theme of Fortune, the motto "I love one woman very much", symbols borrowed from ancient iconography like the phoenix and especially the presence of representations of the myth of Hercules, which Galiot assimilated, using to his advantage the image widely used by the entourage of Francis I, "Hercules Francis". This topic was so important for Galiot that he even owned a tapestry with his arms, showing, as in a bas-relief on the façade overlooking the courtyard, the infant Hercules strangling the serpents sent by Juno, a well-known element of a 17th-century drawing, perhaps from a full hanging tapestry on this subject. When describing the décor of Assier, one cannot forget to mention the presence, on the façade of the grand wing, of ancient-style busts, of which some in glazed pottery, attributed to the Italian artist Girolamo della Robbia, a sculptor in the service of Francis I on the large sites of the châteaux of Madrid and Fontainebleau in particular. A major element of Renaissance architecture between 1510 and 1540, a truly stylistic site where the key principles that led from the early Renaissance to the classical Renaissance were elaborated, with the evolution of the organisation of the façades and the use of ancient-style decorative motifs which gradually structure the elevation, the château d'Assier almost suffered the fate of other large mansions of the 16th century, for example the châteaux of Bury, Bonnivet, Madrid and Verger. In 1768, the Duke of Uzès, a descendant of Jeanne de Genouillac, daughter of Galiot and his first wife Catherine d'Archaic, put three of the four wings up for sale, leaving it up to the buyers to recover stones, metals, lumber and floors. The destruction of this masterpiece was therefore not complete and the remaining wing, ceded in 1788 to the Murat de Montaï family, served for more than a century as a barn for fodder. In 1934 the state purchased the ruins after having conducted major works from the beginning of the century to save it.